Platelet-rich plasma, or PRP, has many benefits for your skin. At Serrão Rejuvenation Center, Dr. John Serrão – a board certified gynecologist who specializes in anti-aging medicine – and his team offer PRP facials for women in Orlando, Winter Park, and the surrounding areas of Florida. PRP, or platelet-rich plasma, is one of the newest advancements in medical treatments. PRP is a component of your blood that contains growth factors. Growth factors are important to your body because of their effects on cells. The interaction between cells and growth factors helps cells of the body to develop, multiply, repair and even transform into new types of cells. PRP has been most often used for clinical applications, such as helping athletes recover from injuries faster and remedy the effects of degenerative conditions, such as arthritis. Cosmetic uses of PRP are relatively new, and Dr. Serrão is proud to offer the PRP facial to his patients. The internal essence of the blood inside you contains life giving fundamental protein growth factors that are designed to restore and strengthen your body. PRP rejuvenation technology harnesses a high concentration of your own biological nutrient rich cells and unleashes them to naturally promote skin health by stimulating a rebuilding of the underlying structural integrity of your skin. LEARN MORE. The PRP Face Lift is a non-surgical, no downtime, form of facial rejuvenation that uses the patient’s own natural blood cells to lift and restore the healthy glow to the skin of the face. LEARN MORE. Dr. Serrão is known for being one of the first physicians to introduce neoteric cosmetic treatments in Central Florida, and his approach to patient care is unparalleled. 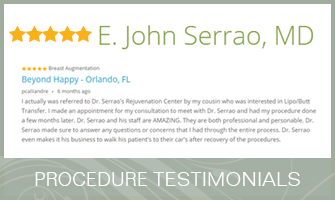 At Serrão Rejuvenation Center, our entire staff focuses on providing you with high-quality care from the time of your first consultation until you are released from the recovery area of our AAAHC-accredited surgical center. The PRP facial and other cosmetic applications are quickly becoming available at practices across the nation, but few clinicians have the extensive experience with the procedure as Dr. Serrão. Additionally, many cosmetic practices tend to recommend more invasive and extensive procedures, yet Dr. Serrão believes that conservative approaches are always the best first options. Find out how a PRP facial can rejuvenate your appearance. At Serrão Rejuvenation Center, Dr. John Serrão – a board certified gynecologist who specializes in anti-aging medicine – and his team offer PRP facials for women in Orlando, Winter Park and the surrounding areas of Florida. To learn more, contact us to schedule a consultation and begin your rejuvenation today. A PRP facial is a procedure that incorporates platelet-rich plasma into our other facial treatments. The PRP works with skin cells to repair damage, such as wrinkles, and give your complexion a fresh, young appearance. What Happens During the PRP Facial? The PRP component is most often combined with microneedling. The micro-channels that are created in the skin with the Eclipse MicroPen provide the perfect method of delivering PRP deep into the tissues. The growth factors is the PRP start to work immediately, repairing cells and stimulating new cell development. How Long is the Recovery from a PRP Facial? PRP therapy does not extend the recovery time of the baseline treatment, such as microneedling. PRP is an addition to our other services, and we can provide the cost at the time of your consultation. Before the appointment, you may want to review our financing options so that you have a budget in mind and know what monthly payments you can afford.